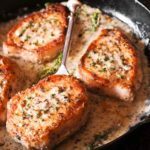 Smothered Pork Chops in Creamy Wine Sauce - What's In The Pan? Smothered Pork Chops in Creamy Wine Sauce are easy to prepare and ready in less than 30 minutes! 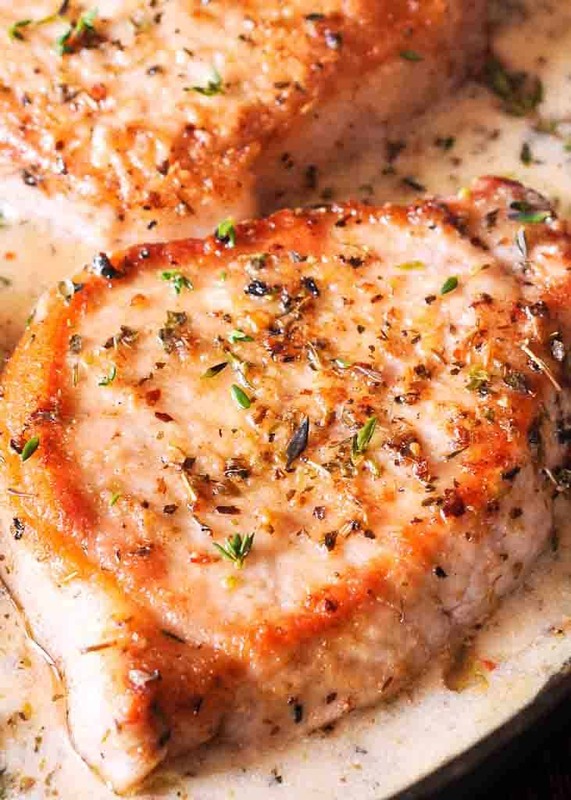 Made with dry white wine, garlic and thyme, these flavorful pork chops are juicy and tender. Do you make pork dinners a couple of times a month? Then you and your family will love this easy pork chop recipe! Cooked in one pan, they are perfect for quick and easy weeknight dinners. Pork chops are super juicy and tender thanks to the fast cooking method. Mm… It’s also good that the pork is also crispy on the outside! Trust me when I say that. It’s a perfectly easy pork chop recipe for busy weeknights. I have been so excited to share my pork chop recipe! This sauce with white wine, cream, lemon and thyme is over the moon good! Think of this as a super easy version of the restaurant style pork chops. I used to be afraid of making pork chops and stuck to Instant Pot Pork Chops only, but it’s so easy! I am going to walk you through the steps and you’ll find making these succulent pork chops is really easy. For this recipe, I like to use thick and boneless pork chops. This works very well because it is easier to not overcook them keep them nice and tender. If you wish, you can also use bone in pork chops if you like those better. I recommend to take them out of the refrigerator at least 20 minutes before cooking. They need to warm up slightly in order to cook more evenly. You don’t want to put a cold chop in a hot pan. Once you have pan nice and hot you will sear your pork chops just until browned. Don’t worry about the pork chops being cooked all the way through at this point. Next, you will remove the pork chops from the skillet and prepare the sauce in the same pan. You will sprinkle flour into the pan. This will be what thickens your pork chop sauce. Whisk in your chicken broth and wine slowly until your sauce is nice and smooth. Then, you will add in your seasonings and herbs. At this point, we will return the pork chops to the pan. This will allow them to warm up for about 10 minutes. Then serve with rice, egg noodles, or mashed potatoes! Which dishes go well with best pork chops recipe? I recommend that you eat the best pork chops with mashed potatoes so that you can spoon the sauce over them! I also have Instant Pot Mashed Potatoes recipe that tastes amazing and is made entirely inside the Instant Pot. But if you want a really loaded mashed potato recipe, how about the delicious Irish Mashed Potatoes? Did you know that you can reduce the number of carbs of this pork chop recipe by making it gluten free? So if you are looking to do that, make sure check it out these Low Carb Pork Chops. What can I substitute for wine? It’s easy to substitute wine with other ingredients if you are unable to tolerate alcohol. Let’s see what you can do! White Wine Vinegar is an ideal substitute for dry white wine. Made from white wine, it has many of the same flavor characteristics, minus the alcohol. Simply use 1/4 cup vinegar + 1/4 cup chicken stock. Rice Vinegar works too in the same proportion as White Wine Vinegar. I often substitute Chicken or vegetable stock for white wine entirely! Especially if you are not a fan of vinegar or sensitive to sulfites in vinegar. For extra flavor, try mixing a tablespoon of lemon juice per cup of stock. 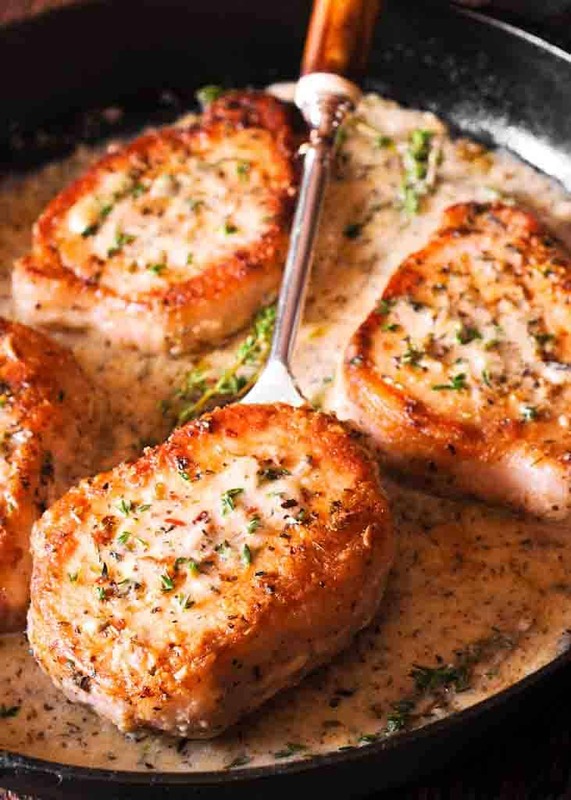 Can I lighten up this creamy pork chop recipe? Use half-n-half instead of heavy cream, or omit it altogether and replace with chicken broth. If you are gluten free, make sure to replace regular flour with almond flour. You may also choose to not dredge pork chops in flour at all. Instead, simply season them more abundantly. Additionally you will need to make adjustments to the sauce. Simply replace wheat flour 1:1 with rice or corn flour, or 1/2 cup Parmesan cheese, or omit it completely. Are you hungry for more pork? Are you in a possession of the almighty Instant Pot? Well, in that case how about Instant Pot Pork Ribs? Check out our video inside the recipe card for how to make Pork Chops below and follow us on FACEBOOK where we share the tastiest recipe videos every day! Pork Chop Dredging Mixture: In a large bowl, whisk together flour, garlic powder, onion powder, Italian seasoning and season generously with salt and pepper. Cooking Pork Chops: Dredge pork chops thoroughly in dry mixture, then heat 2 tablespoons butter in a large skillet over medium-high heat. Creamy Garlic & Herb Sauce: Return skillet to heat, add 2 tablespoons butter and minced garlic and cook for 1-2 minutes on medium heat. Add flour to the butter mixture and blend it in with the butter. Next start pouring in wine while still on medium heat - about 1 minute. Add chicken stock and heavy cream. Squeeze a little bit of lemon into the pan, add fresh thyme and Italian seasoning, season with salt and pepper (to taste) and simmer for 2-3 minutes. Taste the sauce and add more seasoning, if necessary. Final Assembly: Reduce heat to low and return pork chops to pan. Depending on the thickness of your pork chops, you might just need to heat them up a bit to make sure they are done. Drizzle some of the sauce over pork chops and reheat on low for 2-3 minutes or until pork chops are done. I made this for dinner tonight, in one word AMAZING! I made my boring recipe for pork chops tonight. Never again! This looks fantastic! Yum! I need this in my life. I have to rethink dinner tonight. You can use a couple of tablespoons of vinegar instead and add a little more cream or chicken stock. Could this be made during the day then reheated in the evening? Yes, that would be completely fine. These are fall apart pork chops that reheat very well. Great recipe and really easy to pull together quickly. Pretty much everything, save maybe a few things, in it are pantry staples, and the substitutions are just as easy.to find. I made this extremely last minute tonight, and even with having to sub in vinegar and dried thyme (not in the above written subs, but it should be. I didn’t include much -somewhere around 1/3ts), I still felt comfortable enough (and compelled) to slice a few mushrooms up and throw them in. They added a nice little extra something to the taste and texture of the whole dish. For anyone feeling like they’d want to include mushrooms, what I did was as simple as throwing them in the pan at the same time as the garlic. Move them around with the garlic for the same amount of time, then just continue the recipe as written. Can you make without heavy cream? Milk or light ? You can omit heavy cream altogether. Is that supposed to read ‘1/4 cup’ of lemon juice in the sauce, or the juice from 1/4 of a lemon? Made this tonight and it turned out amazing! I had plenty of sauce for garlic mashed potatoes. I will definitely make this again! Thank you Marjorie. We eat it with garlic mashed potatoes too.